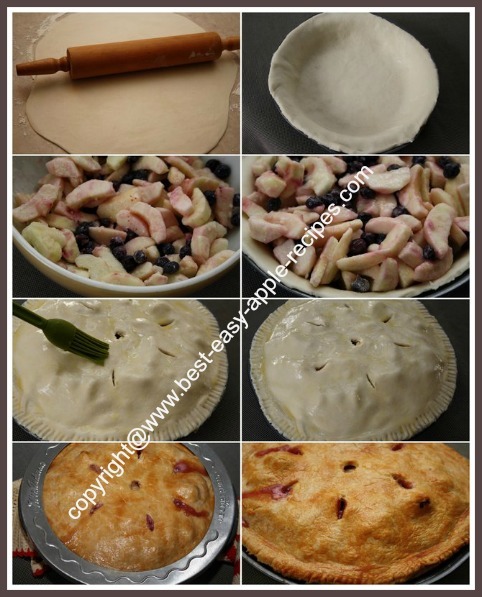 Here is a choice recipe for an Apple Blueberry Pie to make a scrumptious dessert treat with apples and blueberries! I used Empire Apples and McIntosh Apples and frozen blueberries. You can use almost any type of apple for this recipe and fresh OR frozen berries. In a large bowl, combine the sugar, flour, lemon juice, cinnamon and the salt. Add the sliced apples and the blueberries, and toss to coat. Allow the fruit mixture to stand for about 10 minutes, stirring occasionally with a wooden spoon (being careful not to break up the blueberries too much). Line the bottom of a pie baking dish with the bottom pastry crust. Transfer the fruit mixture into the pie pan. Dot the top with the pieces of butter. Trim edges and brush the edges of the pie crust with the beaten egg. Cut slits/vents in the upper pie crust. Brush the entire top of the pie with the beaten egg. Bake at 425° F for 35 minutes. (I add a pastry pie crust shield after the pie has baked for about 30 minutes, to prevent the pie crust edges from becoming too dark and burning). 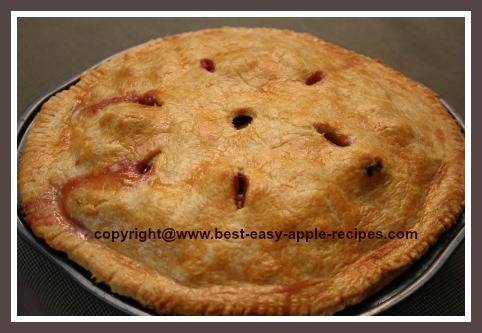 Reduce the oven temperature to 350° F and bake for an additional 30 - 40 minutes, or until the fruit juices begin to bubble through the vent holes in the top crust of the pie, and the apples are tender. 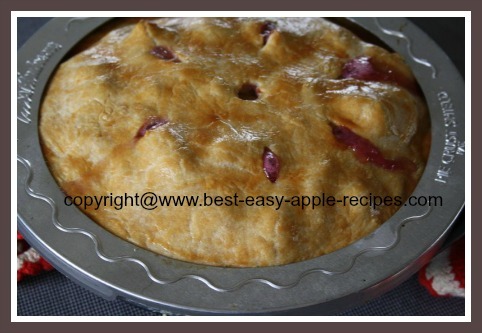 Allow pie to cool for about 4 hours until slicing to serve. 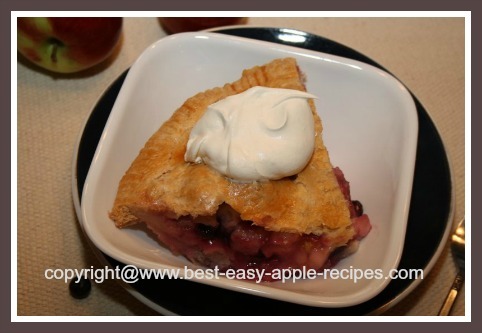 Enjoy this scrumptious homemade apple blueberry pie! I used to have problems with pie baking where the edges of the pie became too dark when the pie was not finished baking. A while ago I discovered the pie crust shield, and now I never have issues with the pastry edges becoming too dark or burning! I heartily recommend the Pie Crust Shield if you bake pies often. Below are examples of protectors that you can purchase from *Amazon.com. Click on the image for additional product specifications and product reviews. Do you own a handy Mechanical Apple Peeler? If you bake a lot with apples, or make a lot of applesauce, you may want to purchase a mechanical apple peeler ... they are an amazing and an inexpensive kitchen tool!